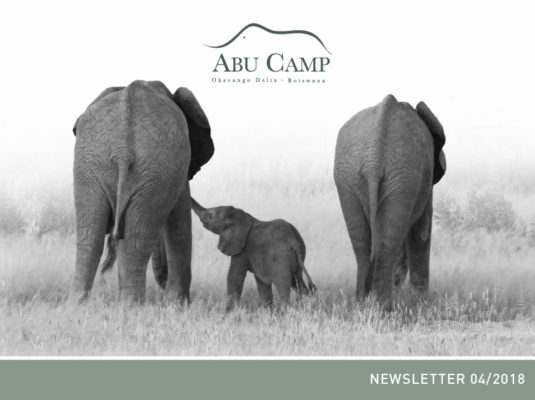 A month of arrivals at Abu Camp! April has been a month of arrivals here at Abu Camp, with two ‘appearances’ vying for the front page and our attention. Although both have had a magical and transformative effect on Abu Camp and the Abu Concession, there was one essential difference between them: one was expected, and one was something of a surprise. As the temperatures have started to fall with the onset of winter, the continued inrush of waters into the Okavango Delta has seen levels rise throughout the Concession. Water that began its journey as tiny rain-fed streams in the highlands of Angola – two countries away – is now recharging our channels and rivers, topping up the lagoons, and beginning to spill out across the floodplains. The lagoon in front of Abu Camp is gradually being restored to its former glory as part of the yearly cycle of swelling and contracting. Thus far, it has reached Room 5 and we are hoping that within the next few weeks, all our guest rooms will be water-facing again. The arrival of more and more water is wonderful news for the creatures that depend on having an aquatic or semi-aquatic environment, from hippo to red lechwe and species of fish that have adapted to making the most of a brief breeding season. Reflections, splashes and two-tone elephants have delighted visiting photographers, and it is hard not to detect a note of joy in the distinctive calls of the African fish-eagles as their watery larder expands almost by the hour. The annual inundation not only changes the appearance of the area, but also expands our options when it comes to exploring it. Boat excursions and mokoro trips allow us to share the beauty and silliness of the world’s wettest dry season with our guests, from bejewelled amphibians clinging to stalks to waterlily-leaf hats. As the area of dry land has reduced, so the terrestrial wildlife has been concentrated onto islands, and as a result the game viewing has been spectacular this last month. Yes, even more so than usual! The big cats have been much in evidence, with some memorable cheetah, leopard and lion sightings on game drives. Anyone raised with the myth that cats dislike water may have to revise their views if they come on an Abu Camp game drive at this time of year. With prey species fleeing through the shallows, predators are often faced with a choice of getting wet or staying hungry, and they don’t tend to deliberate for long! Birders have also been treated to frequent sightings of a pair of Pel’s fishing-owls which are nesting in a tree close to our main area. This large, cinnamon-coloured piscivorous owl is an ‘Okavango special’ and a ‘lifer’ for many of our guests. They are also – rather wonderfully – given to flamboyant fishing displays each evening. Our second arrival this month was largely unexpected, but no less welcome for that. 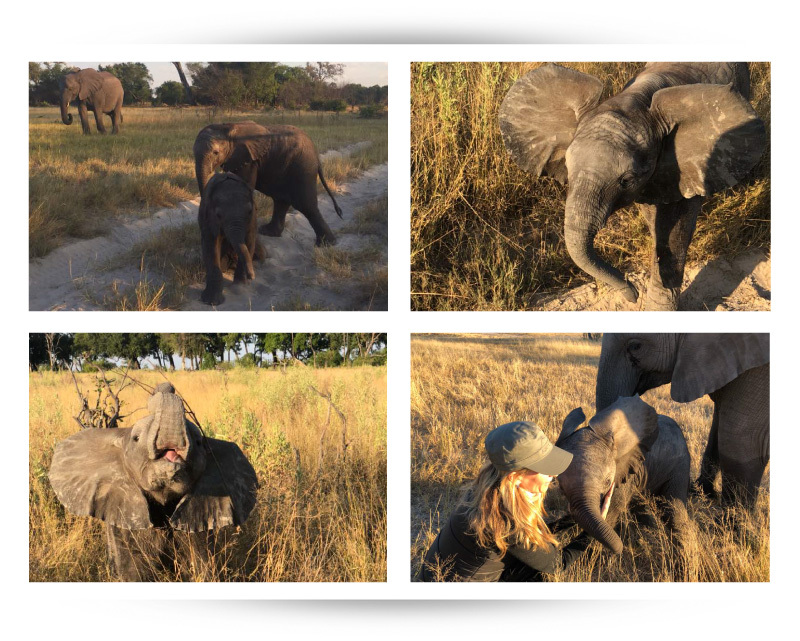 The elephant handlers had suspected that Paseka – our Easter elephant – might be pregnant, but we weren’t expected a second birth in the Abu Herd this year. Just three months after Motlotlo made his appearance, we have had a second 2018 birth at Abu Camp. At around 4:30 am on the April 27th, we heard loud and joyful trumpeting coming from the elephant boma. The elephant managers immediately went to investigate and found that the Abu Herd had increased by one. Paseka’s calf – who we have named Shamiso, Setswana for “surprise” – appears perfectly healthy, as does his mother. The beginning of the inundation season has brought more life and happiness to the Abu Concession than we could have ever imagined. We’re excited that Motlotlo will have a playmate – and no doubt he is too! 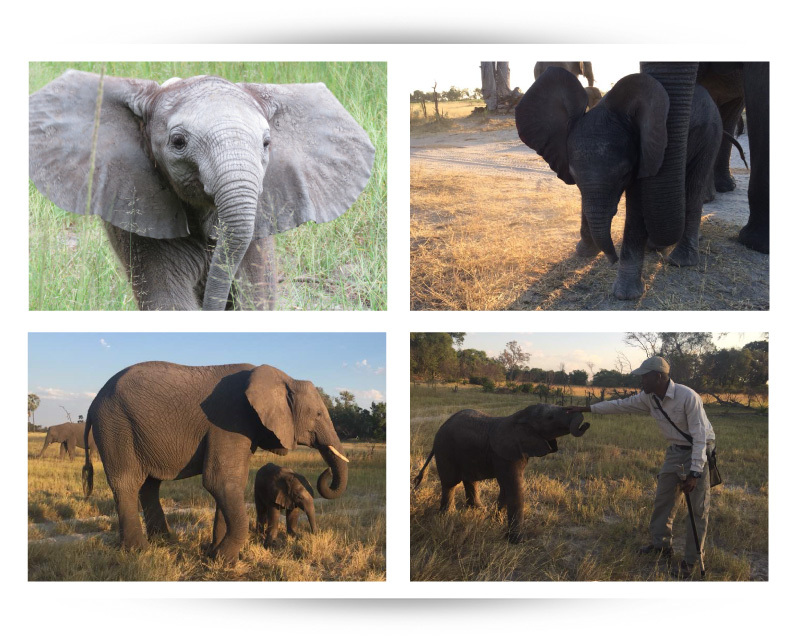 With two young and boisterous male elephant calves in the Abu Herd, we are bracing ourselves for double trouble! This will also be a unique opportunity to study the relationship between two potential rivals for dominance from a very early age. We cannot remember a time when we last had two young elephants of almost identical ages within the Abu Herd. With the birth of Shamiso, a new chapter has begun in the life of Paseka, almost nine years to the day since she joined the Abu Herd. She was found abandoned by a wild herd at Easter 2009 after being attacked by hyaena. Alone and injured, she had taken refuge in the generator room at our sister camp, Seba – perhaps reassured by the elephantine sounds of the machinery there. Now her own low rumbles will be a source of comfort and confidence to her own calf, as Paseka generates headlines all over again.